An interview with the Sentinel Project’s Director of Operations Drew Boyd. We’re used to hearing about drones as agents of death, that since their inception they have often been used for the purpose of violence. Why should people be convinced otherwise? Technology has no moral compass, it is not inherently good or evil. Civil society is the benefactor of many technologies whose development and use intertwine closely with the history of warfare and conflict. However, you would be hard pressed to find someone boarding a flight on a commercial airliner with ethical concerns about using such a mode of transportation. I have yet to meet anyone disturbed by the implications of weather radar despite its roots being planted in the soil of the Second World War. The people reading this article on the internet and on their mobile phones may be unaware of the role that militaries and warfare had on the development of both of these technologies. Drones have the same potential for non-violent and beneficial use as any of these other technologies but perhaps the wounds of modern wars are too fresh for that to be entirely clear. I hope that we are able to demonstrate the peaceful uses of this technology so that someday people will think first of drones as tools to improve lives rather than weapons which so cruelly take them away. Aerial photography for humanitarian purposes often offers only a glimpse once the damage is done and atrocities have already been committed. How would UAVs in the Tana Delta react quickly given a need for immediate action in the scenario of impending violence? Una Hakika is plugged directly into the community and is seen as a trustworthy neutral party and therefore are often the first to receive information about potential conflict. This allows us to first verify whether the reports are true and investigate the scene with our aerial systems. If we determine that violence is imminent we can use our networks to alert authorities, warn those in danger, and even provide safety guidance based on our observations from the sky. In the event that violence is already taking place, we can implement the same measures to mitigate risk to residents while working to document the events by gathering aerial evidence of the perpetrators which cannot be collected safely from the ground. 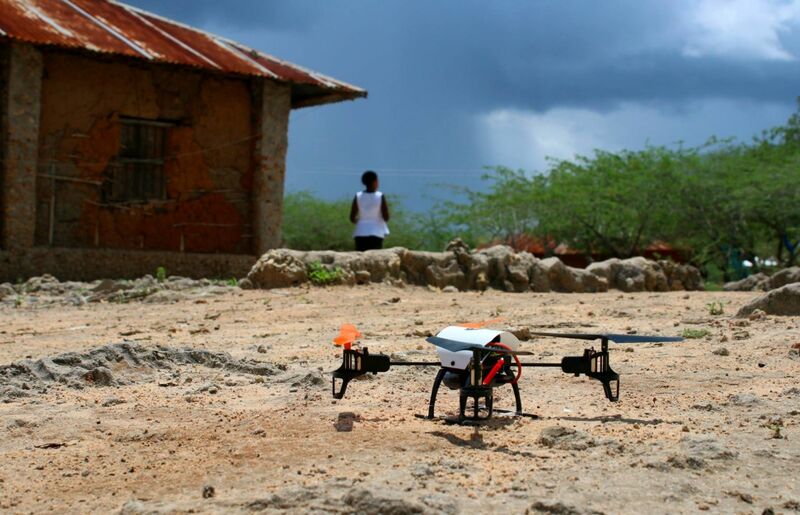 How did Tana Delta residents react to UAV demonstrations? The residents of the Tana Delta completely surprised us with their reaction. They could immediately see the potential benefits even as a small-scale pilot project and they were quick to suggest new uses for the technology which would serve not only human security goals but also address other issues which affect the community, such as disaster response or environmental and agricultural monitoring. They had questions about security, safety, and capabilities – which we had hoped and expected – but were otherwise very supportive. What are the biggest obstacles to creating a UAV program for peace and protection purposes? In truth, the largest obstacle remains public perception, both in the Tana Delta and abroad. We believe in the value of such a program and the potential of the technology and we are more than willing to openly and freely share information, progress, and insights with all interested parties. The hardware, software, and program implementation is well within our capabilities but whether people are able to see the value in it is beyond our control. What can you tell us about the UAVs themselves? How far can they travel in one go? What is the resolution of the pictures taken, and what is the zoom capability of the camera? Our aerial systems are constantly advancing. Currently, we have a fleet of three multi-rotor systems ranging from a small backpack mounted UAV for use in the immediate vicinity of the team, an experimental quadcopter designed by our Canadian team, and a larger hexacopter with a flight time of approximately 30-40 minutes. We have also partnered with 3D Robotics in order to add two long-range fixed-wing systems to our fleet. These fixed-wing systems have a longer range, longer flight time, and larger payload. The standard image sensors for our aerial systems are high definition 1080p for video and higher resolutions for still images. We will be looking to add zoom functionality as well as infrared capabilities in order to operate at night. How does aerial surveillance support what Una Hakika is working towards on the ground? What can such photos tell us, and how would that be put to use in practical terms? Una Hakika works to verify reports which have been submitted by the community in an effort to establish whether the reports are true or false. Until now this has been done primarily through telecommunications and in-person fact checking, however there are limitations to these methods. Areas which are unsafe for our staff to travel, either due to security risks or environmental hazards, diminish our ability to gather information when time is a factor. UAVs also expand the operating range of our teams on the ground, meaning that a single staff member could be present in one village while acting on a report concerning a village a long distance away. Lastly, when fully operational the system will be able to gather information which can be compared in real-time to reports we receive. How can Una Hakika ensure that any sort of UAV program in Tana Delta will reflect the needs and views of local people? The UAV program is designed from the ground up to be a community tool. It doesn’t make sense to implement such a system which relies heavily on community involvement if one were to keep the technology away from the community itself. From the beginning we’ve emphasized input from the community not just in terms of voicing their concerns but also in suggesting new use-cases, being able to provide guidance on when and where to deploy, and taking part in air-ground cooperation for tasks such as search and rescue missions.